Motorola has been embracing Open Source lately, releasing their Java ME 3.0 implementation under the Apache license. Moto is also the leading producer of Linux OS phones although none are available in the US. Motorola produced the first commercially available J2ME capable phone, the i85 back in 2001 on the iDEN platform, but iDEN phones have always restricted the ability of users to load applications from anywhere except the carrier portal. There are many good games and applications on the Nextel portal particularly location aware ones using the phones’ built in GPS. What has been lacking is a way for users to load any of the great free and Open Source Java midlets. Which is kind of a shame as Nextel, including the Boost Mobile prepaid variant, have unlimited mobile web and data available for $10/month. Unlike many GSM phones, iDEN devices require no configuration to allow Java applications to connect to the internet, if you have a data plan everything just works! Hacked, unauthorized versions of Motorola’s WebJAL developer tool have been available on the web for years and were and are used by the large iDEN hacker community. These tools are time consuming and difficult to get working and there are legal issues regarding modifying and distributing this copyrighted software. Open WebJAL is a polished, complete application that anyone should be able to legally install and use. Download iDenJAL from developer.motorola.com/docstools/idenjal/openJAL/. It’s part of Motorola’s developer site but downloading this tool is open to everyone without registration. (Update: free registration is now required. I’ve mirrored the file here on WapReview where you can download it from with no registration required although it may not be the latest version). The download is a .zip containing a single file, IdenJAL.exe. Extract the file and launch it to install Open WebJal. You also need a data cable. These are available on the web from eBay, and many other vendors. iDenJAL is very easy to use. Connect the data cable to your phone – which should not be running any Java programs. Click the Connect To Phone menu item. I’ve found connection problems are rare with Open WebJAL. If you get the message “The phone is currently busy performing another operation…” it means that a Java application is still running on the phone. Go to the Java Menu on the phone and you’ll see the message “End all running applications”, choose Yes and then Finish and try connecting again. If you get “The application was unable to read the required phone information… ” disconnecting and reconnecting the cable usually helps. So what can you load on your phone? Well here’s what I have on my Boost Mobile Motorola i855. Opera Mini 3.0 – simply the best mobile browser. It’s fast, loads almost any website even full sized PC sites and has an efficient , intuitive user interface. Download the Generic Basic version (the Advanced doesn’t work on iDen phones) directly from Opera. Update 26-Feb-2007: The latest released version of Opera Mini is 3.1 which fully supports recent iDEN phones. The Advanced version of 3.1 works flawlessly on my i855. Details here. Update 20-Oct-2007: Opera Mini 4.2 is now available and it works on iDen phones. Links to the latest version of Opera Mini in a format ready to install with Open JAL are on the download page. Google Maps 1.4.1 – Clear, zoomable maps and satellite images with traffic overlays and search for local businesses. You can read more about it at Google, but the version on Google’s page doesn’t work well with the iDEN phone key mappings. YoDude has a modified version that does. gMail 1.0 – short of a Blackberry, a gMail account and this app is the fastest and easiest way to read email on a phone. Download a version with iDEN key mappings from YoDude above. Solytaire – great comerical quality Kondike Solitaire game. Download from Getjar.com which is a good source for all sorts of free, non-pirated games and apps. A minor issue with Solytaire is that you have to use the green Call key instead of the OK button to pick up and drop cards. Book Reader by TequilaCat – Lets you read plain text files on your phone. A simple PC interface loads text files into the application’s jar file. Book Reader can load very large files by splitting them into multiple .jars. Get it from the author. Notepad – Take quick notes on the phone, written by Motorola for free distribution. Available from Getjar. DaizoAES – Secure password storage with web based backup and restore. From the author’s site. Update: the Dazio site and backup server seem to be down. You can still find the program on GetJar and it will work but you won’t be able to backup and restore. If you’re not an iDEN user, all the Java programs mentioned, except for Mologogo, are generic enough to work on almost any Java ME capable phone. This entry was posted in Apps, iDEN, Opera Mini by Dennis Bournique. Bookmark the permalink. If you get an error while sending an app or game to the phone with iDenJAL it generally means that the app isn’t compatible. I don’t think Bolt Lite works on these phones, try Opera Mini 4.2 or 3.1 they definitely work. I don’t have any experience interfacing hardware with the serial port on iDen handsets. Hi anybody knows about the following…i am trying to connect Iden phone(i670) Falcon connecter to external display unit.I need to know which com -port to select in the phone side. If you mean in Opera Mini, position the cursor on the image, press the “1” key, choose “Open Image”, the image will open in it’s own page, press the “Save” button at the bottom of the page. This doesn’t work on all phones, I don’t know it it does on the i930 or not. hey ! thats fine. The iden WebJal not Opera mini the Webjal to load rringtones THANK YOU).if you goto “www.harrythomson.com”,you can get the information needed to patch webjal. iDENjal evidentally doesn’t do the wav thing which jal will allow me to transfer the wav to my phone? I want to be able to control my iDEN phone remotely. For example: initiate and terminate calls, as well as communicate directly with the phone user. I know the phone has an external Push to Talk line however, I’m not sure to know if there’s signalling when the phone is receiving a call. Any ideas? Will this app work for me? Motorola’s open jal will work with most iden phones and the i920 and i930. The other jal’s (like webjal) will work with most of the “iden” phones (like the i580 or i880). It will NOT work with Powersource (hybrid) like the ic402, ic502, ic602, or ic902 or the smart phone models like the i920 or i930. The HarryThompson.com website has more info on this. none of these work with the new firmware for i580 i take it? Can some one send me the original WebJAL because for some reason mine keeps sayin its unable to retrive the info from the main server..p.s my internet still works so it has to be the program. I hope some one reads this soon. The iden WebJal not Opera mini the Webjal to load rringtones THANK YOU).if you goto “www.harrythomson.com”,you can get the information needed to patch your webjal. You are right Monty, Motorola has changed the site and now requires you to register as a developer before you can download iDenJAL. This is so stupid. Motorola should be making it easier, not harder to install application on their phones. They don’t seem to understand that a free and open software environment is what will drive mass adoption of mobile data and in turn greatly increase revenue for both carriers and handset makers. It doesn’t seem very “open” to me, since you have to login to get it, and you have to have a dev password to login to the download site, ARGH! iDENJAL only does Java apps, you still need WebJAL to load ringtones and wallpapers. iDEN phones are very fussy about ringtones being in the right format. I don’t convert my own music usually, I just download free converted tones from http://www.nextpimp.com/. I want to move a wav file from my computer to my phone to use as a ringtone. Wanted to mention GPS Navigation app from Veripath (http://veripath.us). Works great on iDEN phones, quite inexpensive. Of course you are right, Open WebJAL only loads Java midlets. To load ringtones and wallpapers you still need one of the “alternative” JAL’s. But it does open things up a bit with a tool that the average Joe iDEN user may feel a little more comfortable with. I wouldn’t be too quick at getting rid of WebJAL or MyJAL or…whateverJAL. idenJAL is great for what it does: installing Java apps. Something any Nextel owner could do through the on-line mobile applications manager, assuming one is signed up for the (free) MyNextel account administration feature. 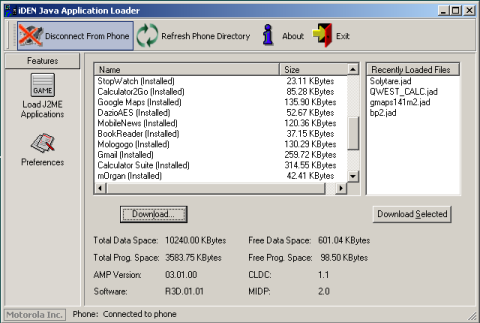 On the other hand, the other “JALs” still provide the ability for users to upload their own (properly formatted) ringtones and wallpapers to their Nextel handsets via USB or serial cable, something that idenJAL doesn’t have the capacity to do, and is otherwise near impossible by any other means.